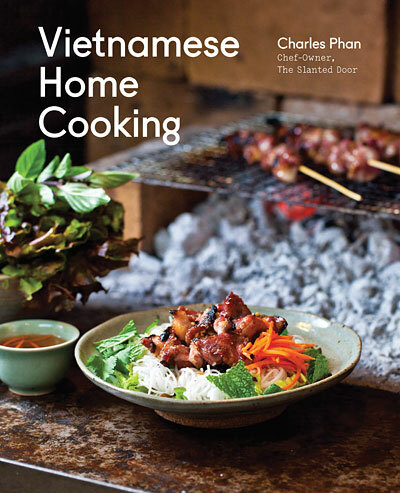 An Interview with Charles Phan, Author of "Vietnamese Home Cooking"
Charles Phan. Image courtesy of Eric Wolfinger. 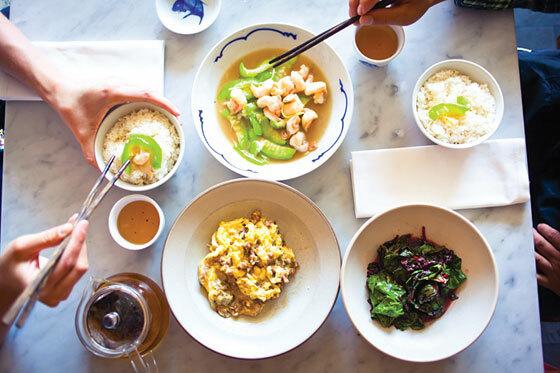 Getting a reservation at the Slanted Door is a constant challenge for both locals and tourists which shows the power of home-style Vietnamese dishes like shaking beef, crab noodles and spring rolls served in a stylish setting with fabulous views. There’s now something of a solution for those pining for a Slanted Door fix: Chef-Restaurateur Charles Phan has a new cookbook called “Vietnamese Home Cooking.” The book is Phan’s first and offers how-to tips for creating dishes like black cod with lily buds and dried shiitakes, lemongrass beef stew, pork and shrimp spring rolls, and Sichuan cucumber pickles. Phan will be discussing his book at the Commonwealth Club tonight Thursday, October 4. 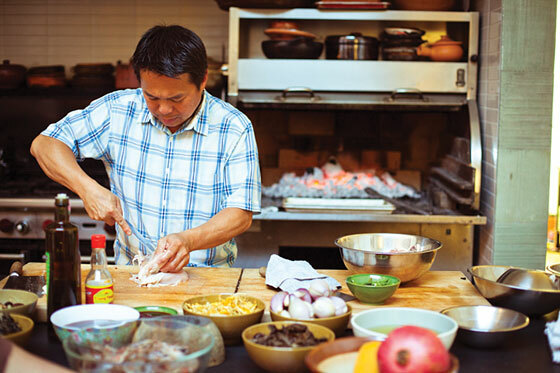 Phan put Vietnamese cooking on the American culinary landscape when he opened the Slanted Door restaurant on Valencia Street in the Mission back in 1995. It was the first restaurant of its type to offer high-end Vietnamese food, often made with farm-fresh and as-local-as-possible ingredients. From there, he has built a mini-empire of Bay Area restaurants and was one of the first anchor tenants to sign on to the remodeled Ferry Building landmark in 2004. That year, he won the James Beard Foundation award for Best Chef, California and in 2011 was inducted into the foundation's Who's Who of Food & Beverage in America. Born in Da Lat, Vietnam in 1962, Phan and his parents and siblings all relocated to Guam just before the fall of Saigon. They spent two years there before settling in San Francisco in 1977. Bay Area Bites talked to Phan via phone interview about his new book, cooking with Alice Waters, his “refugee thinking” and upcoming Bourbon and fried chicken “Southern bar” concept. His comments have been edited for clarity and length. Bay Area Bites: Why do a book now? Phan: I needed more recipes to fill the book so I had to wait. [Laughs.] The recipes are all similar to what we do at the restaurant, which is to promote Vietnamese cooking. I think a lot of people don't understand the way and how Vietnamese eat their food and what the philosophy is behind each technique. We have to explain that all the time and tell people “this is how you eat the food.” I did the book because I hope there’s interest. I lunch every year with the Ten Speed and Chronicle Books folks, and they’ve encouraged me for the last ten years to do this book. Bay Area Bites: Out the Door at the Westfield Mall shuttered under somewhat mysterious circumstances. What happened? Phan: I can’t really talk about it. Bay Area Bites: Where do you see yourself in relation to being a cook and businessman? Phan: For the title of chef or cook, I don’t really differentiate. At the end of day, you’re making food for people. I didn’t come from formal training. Yet, we’re all after the same thing -- making amazing food for people. I don’t really worry about the hierarchy of a name. I think every chef is nervous about what they do. If not, then it’s not interesting. As for business, it’s like doing homework in college. If you want to pass the test, you have to do it. Or you blow it and don’t turn in your paper. A lot of people become our family soon after they become our staff. I don't see them leaving and so it makes sense for me to figure out a way to make a lot of money for all of us, a nest egg. Work-wise, we grow and change and can’t always be in the same spot. Like when a bartender becomes a bar manager, we can take that into account when we're looking at growing the business. We’re about to start a bourbon concept and will be able to move as a group. We may do something that’s cocktail-centric but food’s always in play. Maybe the next project could be a wine bar. It’s really about growing the family so we don't put all our eggs in one basket. I enjoy the business and work side of it. Vietnamese meal. Image courtesy of Eric Wolfinger. Even with the existing restaurant, we look at how to improve and change it so we’re not stagnant. We’re always asking, “Is there anything else we can do?” Also people come for shaking beef... they are looking for that and that’s what they want. Especially if it takes a couple of weeks to get a reservation! And I said, “Yeah, I don’t get to do this every day. I have other obligations.” She said if she had her druthers, she’d also be in the kitchen every day. But we are grown-ups so we have to take care of things. Bay Area Bites: You live near the Fillmore. Do you have any favorite food or drink spots? Phan: If I go home, I go home. I promised my kids that I’ll be home 3-4 nights a week. Yet I don’t go home every night by dinnertime. Chutney is one of my favorites. Usually, I get a cocktail at Bourbon and Branch or at Tradition bar across the street. There I can get high-end cocktails and good food. At Chutney, I really like their food and I don’t have to make a reservation. I think a lot of restaurant people can’t deal with doing a reservation at a restaurant on a busy night. For cocktails, often I drink at my own place because I get them for free. [Laughs.] At least in my head I’m not paying. Bar Agricole is a good spot. We’re doing a whole bourbon and fried chicken “Southern bar” concept. I’m working with my good friend Olle Lundberg. He and I both got addicted to bourbon, which is why were doing this project. I didn’t really drink a lot of cocktails until we moved to the Ferry Building. I started with a Margarita and tequila. Next thing you know I tried bourbon. I tend to like it straight up and neat to cut back on the sugar. Bourbon is sort of like the alcohol of choice. It’s going to be harder and harder to get good bourbon. Big companies are taking over all these small distilleries. Bay Area Bites: Who are your mentors? Phan: My father. My parents ended up doing stuff they’d never done before. They opened a sewing shop -- and my mother had never threaded before. I call it the refugee thinking. Do your homework, and if you can deal with the worst-case scenario, you can deal with it. And if you can’t, you can’t. I always look to other chefs and reflect on what they are doing. With Alice Waters and her restaurant: when I was in Berkeley, it was seeing not just how she did the organic thing but the way she runs her business. Her menu was small. She’d put up six to seven items and customers would come in to eat. Prior to that, most Chinese restaurants had 100 items. That just gave me the confidence I needed. Bay Area Bites: What are the pros and cons of building a restaurant business? Do you have any funny stories? Phan: I was cooking at Chez Panisse, cooking on Monday and it was really hot. I felt like people were making fun of me for bringing Vietnamese food to Berkeley and also the weather from Vietnam. On the second seating, the power went out and we had to put out the fire. There was smoke and dust everywhere. I looked like I had Richard Gere’s hair -- it was grey. [Laughs.] I don’t look like Richard Gere. I wish I did. But I had his hair! That’s how it rolls. Nobody seemed to care that we didn’t have power. We made everybody’s food and the power went out twice. I just had a long shower after that. I was covered in dust and soot. Bay Area Bites: How did you learn to cook such great food? Phan: I think the key is to learn how to eat first. If you are exposed to a lot of great food and you start building your vocabulary of flavor. First you need the palate: how to visualize the picture and how to get there. I think the book is the same -- learning how to know each dish and visualize it. Just don’t come and tell me “it’s really good.” I do that to kids a lot -- my goal is to really affect kids and get them addicted to good food. There may be a lot of things like drugs and stuff to get addicted to; I think food is better because they’ll see the joy in it. Bay Area Bites: Have you ever experienced racism in kitchen? Phan: The first week we opened, people were expecting free tea. Every restaurant at that time gave out free tea. The whole point of opening the Slanted Door was to combat stereotypes. I think it’s just a lot of stereotypes -- customers come in saying, “where’s the bread?” They don’t do that at a $4.99 Chinese restaurant. People are very funny about expectations and pricing. A lot of people think they can get cheaper food in the Tenderloin. But obviously there are enough people that agree with my pricing. There’s a way to pay for the farmer, pay for the worker. At the end of the day it’s a capitalist society. You are not supposed to charge more than your colleague with the same genre of restaurant. But that doesn’t bother me. I am challenged by that obstacle, and look at it as a puzzle to figure out. We’re a little different and I’m completely comfortable in what I’m charging and what pork I’m serving. At some point you can’t please everybody. You shouldn’t put out food you don’t like. I’m not a big mussel fan so it’s not on the menu. That’s just my preference.